Well hello Sunday my old friend. I can’t believe another week has passed again! Yet another busy week at work, but at least it makes the time pass quickly! But I get Friday through Tuesday off, so I spent all Friday being a general waste of society and marathoning Netflix shows. But hey – I’ve got a bunch of posts scheduled for next week and I read some really great books, so really what is the downside here? And the book ban breaking continues! Some of the books I preordered, or ones that didn’t show up till this week, finally came in, and I think I may be excited more than last week?? Aren’t they pretty??? After I fell in love with Nina LaCour’s writing in Everything Leads to You, I had to get her other two books, Hold Still and The Disenchantments. And after Jo’s rave review, I had to get There Will Come a Time by Carrie Arcos. BRING ON THE FEELS. And to satiate the sci-fi/fantasy/paranormal side of me, I preordered three books that were released on the 8th: Four (Veronica Roth), Midnight Thief (Livia Blackburne), and Where Silence Gathers (Kelsey Sutton). I NEED MORE TIME IN MY WEEK TO READ ALL THESE BOOKS. IT’S A SERIOUS PROBLEM. It’s still blazing hot in California. Though it was nice (nice meaning like 90F with a breeze) on Friday – at like 8 in the morning. I didn’t go outside after that. I think I need to start carrying around a cup of ice with me wherever I go. Last Sunday, in my never-ending attempts to manage the thyroid issue my doctor won’t quite call hypothyroidism because it’s “on the border”, I’ve started the Paleo diet. Lots of veggies and fruit over here! I had already gone gluten-free, so it wasn’t horribly painful, but OH MY GOD I MISS DAIRY. SPECIFICALLY MILK. But other than that, I actually don’t miss sweets all that much. Sometimes I want a chocolate chip or two, but it’s easy to ignore that. And I have a lot more energy, and I’m sleeping better. So – week one is a success! Oh, and I lost four pounds since I went gluten free, so now adding the Paleo thing I’m pretty sure I’ll finally start seeing some progress. Celebrated my first blogoversary! There’s an international giveaway going till the end of the month! 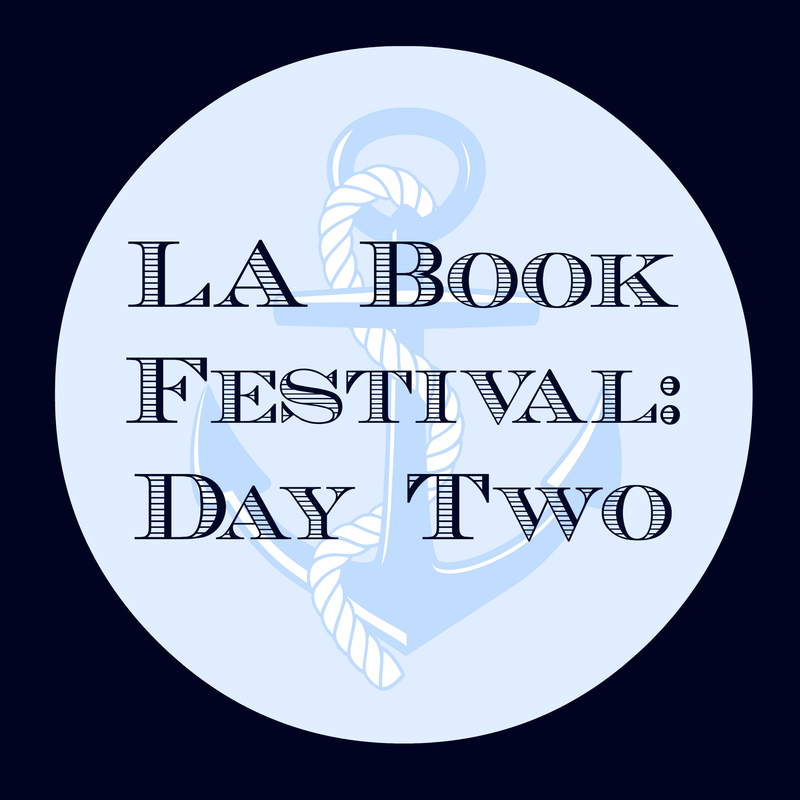 Welcome back to my recap posts about the LA Festival of Books! Day two, Sunday, was definitely the jam-packed day, so get ready for a bunch of pictures! Whereas I had Veronica on Sunday, I was totally alone on Sunday, so it was a bit of a different experience. But it turned out far better than I expected, and I was so sad that it was over! I left earlier, since I had been late the first day, and I didn’t hit any traffic! So I ended up getting to the campus at 8:30 – almost three hours before my first panel started! So I rearranged my schedule a bit, and went to the Mrs. Nelson’s tent (which ended up being my stomping grounds for the entire day), since there was a Marissa Meyer signing at 10:15. I ended up being first in line, sitting on a rock until a few other people joined me at about 9:15. And then – miracle of miracles! 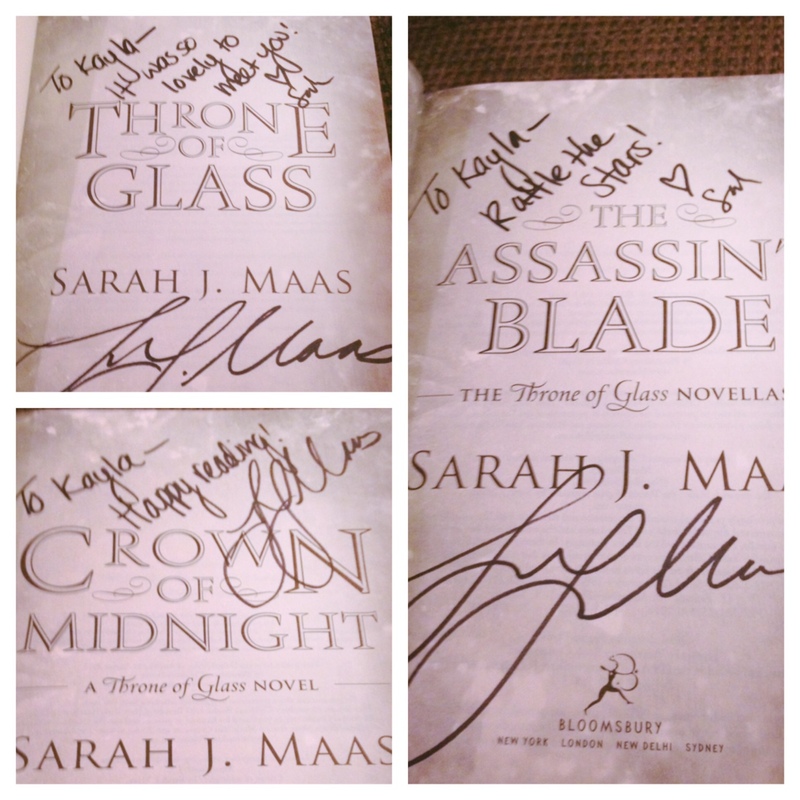 – they let me know that Sarah J. Maas would be there at the same time! So after waiting and waiting, the signing started, and I saw both authors! 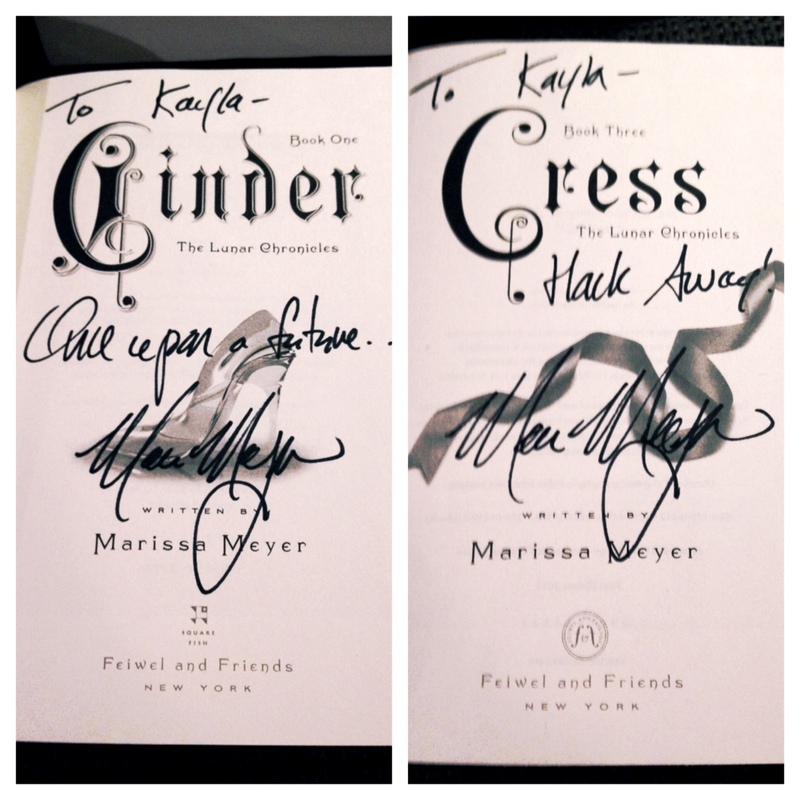 I already had Scarlet signed, so I only had to carry Cinder and Cress. Marissa is really sweet, and I LOVE her hair. Next was Sarah, and she was actually super fun to talk to! We were laughing at her sunglasses, since she had been placed right where the sun was in her eyes, and of course the glasses were all bent at the nose. I was so excited when I saw the message on The Assassin’s Blade – it’s my favorite quote on my favorite book in the series! After the signing, I RAN all the way across campus to make it to the Conversation between Veronica Roth and Leigh Bardugo, and made it just in time for when they were letting people in. I ended up on the second level in the theater, but it wasn’t horrid seating, and I could hear perfectly. And let me just say – those two ladies together is the greatest thing in the world! They were absolutely hilarious, and between answering with serious, thoughtful replies, they were totally goofy and fun. It didn’t even seem like an hour at all. There was an opportunity for a Roth signing, but I didn’t even try since I knew it would be hours and there were so many other panels I wanted to attend. Sorry for no pictures of their conversation – I was far too high for any quality, and they had said no photography anyway. 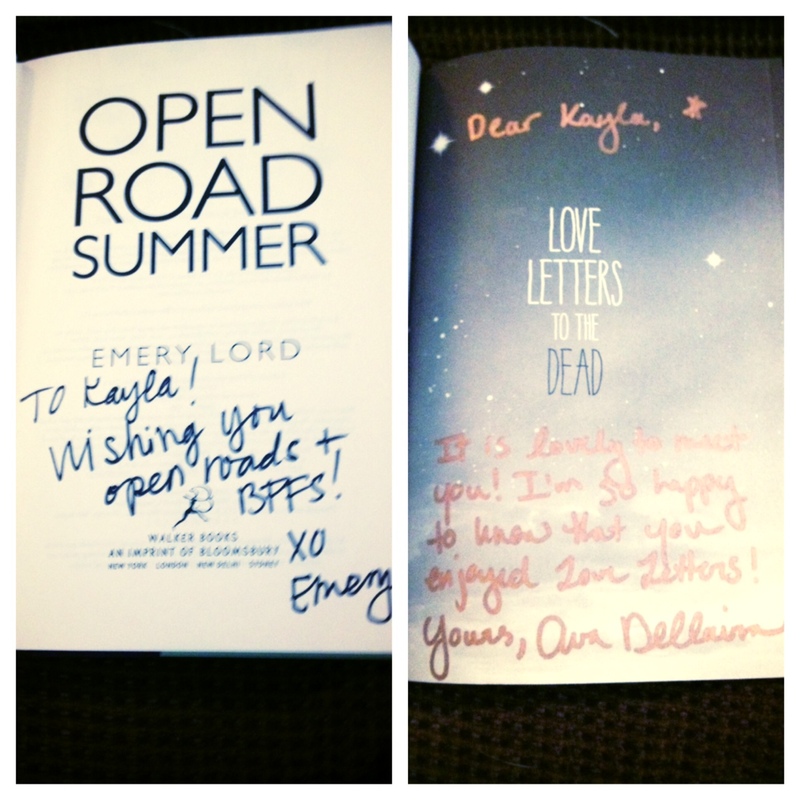 I just have to say – Emery was an absolute pleasure to meet! 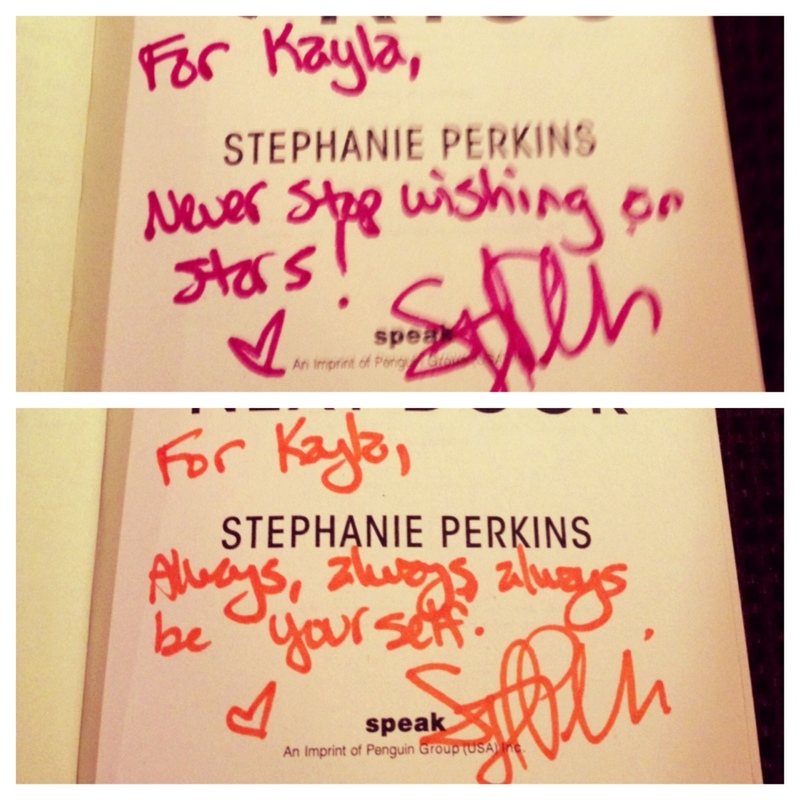 She was so easy to talk to, and I didn’t feel nervous like I usually do when meeting authors. We actually got to talking about my reading, and how I’ve just gotten back to YA last year. When I said that contemporary was my least read genre, but I was beyond excited for Open Road Summer, she smiled so wide and said she hoped it would help me dive into the genre even more! I wish I could have talked to her more, but didn’t want to be rude to everyone else in line. After meeting Emery, I ran over to the Stephanie Perkins signing that had been going on at the same time, and that was probably the longest I waited in an “active” line, since I joined after it had already started. Even so, it was only about half an hour before I met Stephanie! And she was so easy to talk to as well: she loved my hair (eeepp!!!) and we started talking about how hard it is with pixie cuts to get that exact shape that’s perfect for your face. The sharpies match the covers!! While I was waiting in line, I missed the first half of the Young Adult Sci-Fi: Fantastical Tales with Marissa Meyer, Leigh Bardugo, Sarah J. Maas, and Cecil Castellucci, but since I had already met them all one way or another, I wasn’t too worried about it. I caught the last half, but since I was in the way far back I couldn’t hear very well, or get any pictures (sad day!). So it really just ended up being a time for me to sit down and rest my feet and rearrange my bag since all the signings had gotten them all mixed up and upside down. Once that panel ended, I was able to sneak a seat on the grass underneath the trees for some shade, since the seating was right in the sun and I didn’t feel like burning. After a 30 minute break, wherein I read Cress (holy cow why did I wait so long itssogood!!!) and relaxed some more – there was a lovely breeze that finally came around. 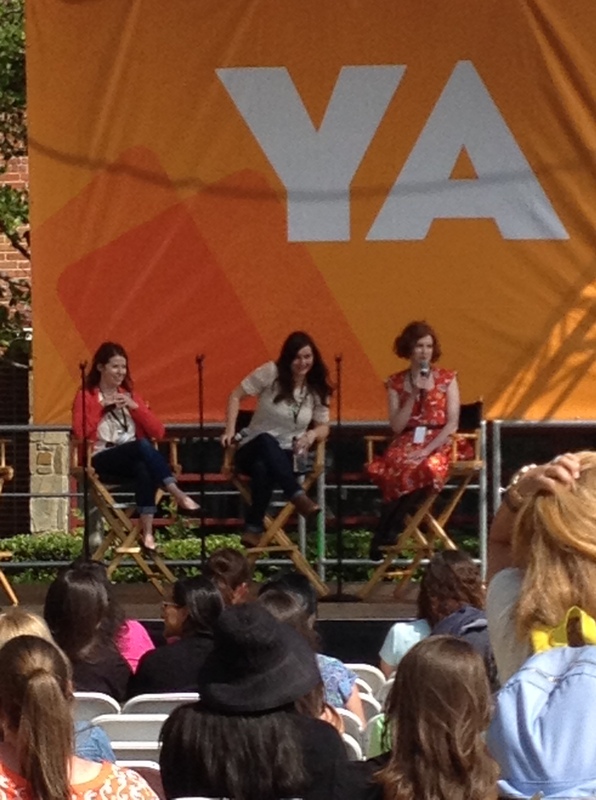 And then *drumroll please* the Young Adult Fiction: Told From the Heart panel started! Again, sorry the pictures are poor quality, but it was as close as I could get! I loved this panel – it was a perfect mix of talking about swoony boys and all the authors encouraging the audience that A) the romance between friends is important too, and B) boys in reality CAN be as good as boys in books. All the ladies were relaxed and chatty, and it felt like a heart-to-heart between friends more than a panel. Surprisingly one of my favorites of the day! After that, I went back to Mrs. Nelson’s booth for my last signing: Ava Dellaira, author of Love Letters to the Dead (picture is up above next to Open Road Summer). She had a million sharpie colors to choose from, and of course I picked the dead one! We spent about five minutes trying to find sharpies that worked: I told her that I was just the test run and I was weeding out the weak! So that was my weekend! It was way different than I was expecting, but in the best way possible. Veronica and I have dreams of going to BEA next year – hopefully LA prepared me enough for that trip! Synopsis from Goodreads: One choice can transform you, or destroy you. Every choice has consequences, and as unrest surges in the factions all around her, Tris Prior must continue trying to save those she loves, and herself, while grappling with haunting questions of grief and forgiveness, identity and loyalty, politics and love. First of all, I loved Divergent. Loved it! But this time Insurgent didn’t quite live up to the standards of its predecessor. I still enjoyed it, thoroughly, but it didn’t have that same sparkle. It had that sense of an interim novel – the setup for Allegiant, not a continuation of a novel that can also stand alone. So I didn’t like the characters – well – Tris, as much as in Divergent. But I still loved Tobias, and Uriah became a new favorite as well. Tris – This is where I saw a lot of parallels to Katniss (Catching Fire version). She’s still Tris, but with the trauma from the end of Divergent, she’s different. She’s a bit more skittish, but at the same time she’s wildly reckless. And while she deals with her post-traumatic stress, she makes a lot of ridiculous decisions that don’t even make sense other than to cause drama. And she has this hell-bent focus on self-sacrifice: so much so that it no longer becomes sacrifice, but rather suicide disguised as altruism. Tobias/Four – I still love this boy. Sometimes he’s really harsh to Tris, but I think that’s what makes him so human and keeps him so interesting. He’s vulnerable, but not childish or whiny. And he takes everything that scares or haunts him and channels it into moving forward. I just really can’t express fully how much I love the multi-dimensional aspects of Four. Other characters – Some of my favorite characters were actually the secondary characters. They didn’t have a huge presence in the novel, but I always enjoyed their page time. Notable examples include Caleb (even if he screwed up), Uriah (I love his humor, and his relationship with his brother), and Lynne – she’s just badass. As with Divergent, I still love the whole idea of everything with the factions and what was going on. And in Insurgent, Amity, Candor, and Erudite are explored more in depth – definitely the world-building I was searching for! Veronica defined all of the factions very well, and it was even more interesting to find out that the boundaries aren’t as clear as everyone said they were. Not only that, but even having some of the factions admitting to drugging their citizens to maintain a line of thinking was a surprising twist. The plot this time was a bit too weighty for me. There was so much going on, and sometimes I didn’t know what really happened. It was like whiplash a bit – Tris was back in Abnegation, then all of a sudden she’s storming Erudite. She says she’s with Tobias, but then all of a sudden she’s on Marcus’s side. If a few scenes had been cut out, I think it would have flowed a lot better. And that cliffhanger was fantastic! One thing I noticed when I was reading: Veronica uses a strange lack of contractions. I’m not sure if it’s supposed to be a mark of the society, or if it’s just her writing style, but sometimes it reads more like an academic paper rather than a novel. Despite my few nitpicks, I really did enjoy Insurgent. I just feel that it didn’t quite live up to the standard Divergent set. I’m really looking forward to seeing how everything resolves in Allegiant. I know some of the generalities, but I want to see the details for myself rather than hear it through everyone else. I’ll see you all on the other side – you better have a trauma kit prepared for me. What did you think of Tris’s insistence on sacrificing herself? Was it motivated by altruism or do you think she had a death wish? Now that we know more about the factions, which is your favorite? Which do you identify the most with? Do you think self-sacrifice, no matter the motivation, is still honorable? How do you feel about the trend emerging in YA lit that the protagonists show symptoms of PTSD after traumatic events? Do you think it makes the book more realistic, or do you think it just results in unnecessary angst? 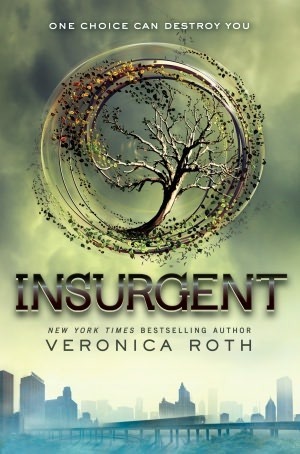 Synopsis from Goodreads: In Beatrice Prior’s dystopian Chicago, society is divided into five factions, each dedicated to the cultivation of a particular virtue—Candor (the honest), Abnegation (the selfless), Dauntless (the brave), Amity (the peaceful), and Erudite (the intelligent). On an appointed day of every year, all sixteen-year-olds must select the faction to which they will devote the rest of their lives. For Beatrice, the decision is between staying with her family and being who she really is—she can’t have both. So she makes a choice that surprises everyone, including herself. Okay… so once again… I kick myself for slacking for so long. I read about this book ages ago, when it was featured in Seventeen magazine prior to its publication. I KNEW ABOUT THIS BOOK FOR YEARS BUT DID NOTHING. So finally I listened to the always-wise words of Andi and Veronica, and sat myself down to read Divergent and Insurgent before the release of Allegiant this last Tuesday. And depending on when Barnes and Noble gets its act together, I may or may not be crying over Allegiant by the time this post publishes. Anyway. While I was reading, I kept bugging Veronica (but what’s new about that?) and I think my exact words when I finished Divergent were: HOLY FRICKLE FRACKLE. And I stand by that statement! Seriously, I need to be strung up by my toes for procrastinating so long. Also, Minor Spoiler in the character section. I already knew it before I read the book, because it’s one that’s hard to avoid in general. Read it if you want! Well, you guys were right. Again. 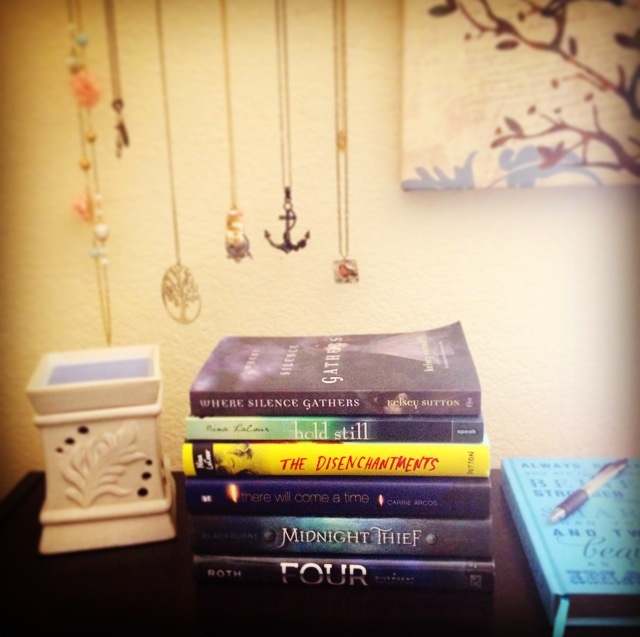 I loved all of these characters – and they were so well rounded and well written! And they had flaws – it was perfect! Beatrice (Tris): First of all, I was so happy that Tris wasn’t a whiny protagonist. I’ve had enough of those lately, and I couldn’t handle it if she turned out to be another one. She had her angsty moments, but they never lasted. She moped a bit, and then moved on. There’s stuff to do! And her development from repressed Abnegation to bold Dauntless was so beautiful: it folded out bit by bit, becoming so rich in hue and depth that by the end of the book it was like there was an entirely new Tris. And then Roth even differentiated that: Beatrice, Abnegation, turning into Tris, Dauntless, and ultimately the Tris that embraces her Divergent status. Tobias (Four): Andi, if you’re reading this… You’re right. You’re absolutely, 100% right. And I owe you a Starbucks or something. Because damn I have not loved a male character as much as I love Four in a very long time. He wasn’t perfect – he was snappy and blunt and rude sometimes – but that’s what makes him amazing. Even with his semi-tragic backstory, he never took it to the woe-is-me stage. Yes, it sucked, but I’m moving on, was his attitude. And then he had the alternating burning excitement and icy stoicism that left me breathless. Honestly, one of the most well-written characters I’ve come across in a long time. Concept: I always find it interesting when caste systems are introduced in dystopian societies, and it’s especially intriguing to see how each author sorts their characters differently. The idea of five factions was brilliant, and then the curve-ball of a Divergent person was a nice twist. 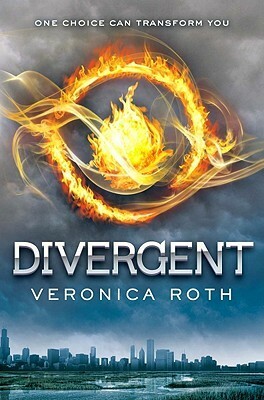 And I also really liked how Roth revealed that so many characters were Divergent – it makes so much sense. Humans are made up of contradictions – not many people ascribe to a single way of thinking. We twist and turn and change as we grow and mature, so I wasn’t bothered by the high number of admitted Divergent citizens. Plot: I know some people might be upset about the slow-ish bits when Tris enters the Divergent training, but I’ve always loved those kinds of moments. Like the classes in Harry Potter were my absolute favorite scenes! I just love seeing characters learn – I learn vicariously through them, and it’s just so entertaining. I’ll have this on my re-read list for sure, when I get over the book-hanger that is Insurgent and most definitely Allegiant. Also, I took the faction test at the end of my book, and I’m mostly Erudite, with a touch of Amity. What faction were you aligned to?